Vitamin C | Cooking Ripe! Before this summer I never bothered with trying to grow tomatoes. I know, you can’t call yourself a real gardener if you don’t grow tomatoes. But here’s the deal: I just didn’t really like them. Oh, I love tomato sauce, in fact I could pretty much bathe in and drink ketchup, salsa, marinara, or pizza sauce. It’s the actual raw tomatoes I didn’t really care for. Yes, I know that tomato sauce starts with tomatoes, but a plain ol tomato has….well, texture issues. It’s hard yet pulpy and squishy and seedy and then there’s the skin. Am I right? I never eat a raw, naked tomato slice – nope, not even on a burger or a taco (yes, I pick them off!). Aside from the fact that I didn’t really like tomatoes, growing them sounded pretty difficult. 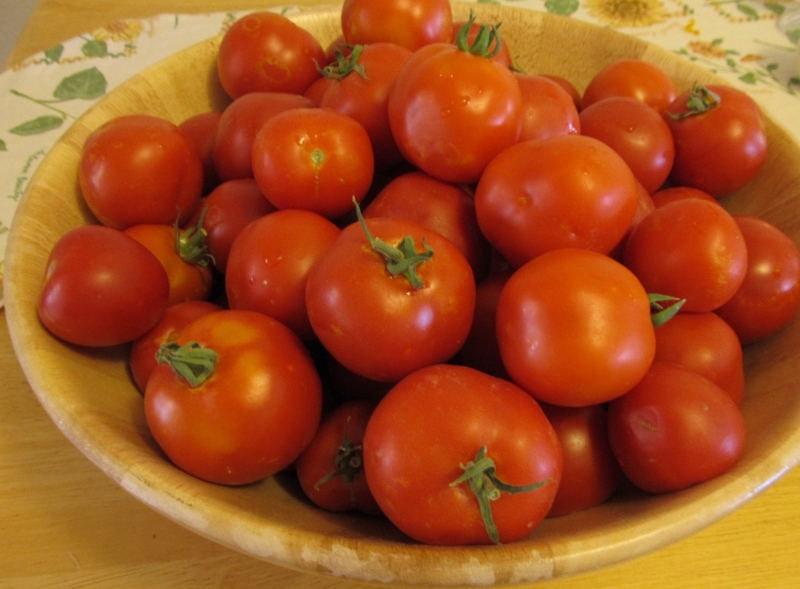 People are always going on about issues with their plants – no tomatoes, dropping tomatoes, no ripe tomatoes, frozen or heat exhausted tomato plants. Sounded like a big hassle over something I didn’t really want to eat. I stuck to growing the easy stuff like squash and carrots. I think it was sometime last winter when I opened a can of diced tomatoes with basil and dumped the contents into my saucepan to make some spaghetti sauce when it hit me: I could make my own canned fresh diced tomatoes if I grew tomatoes! DUH. My cupboard is always stocked with a variety of canned tomato products: diced with green chiles, fire-roasted, whole, stewed, crushed. I use them all the time in my cooking because I love the flavor when they are cooked down. It’s just the raw variety I find unappealing. So, there it is. I grew tomatoes this year and now I have to do something with them. I’ll tell you about the types of plants I grew in a future post, but I’ll tell you that I ended up with five plants: three cherry/grape varieties and two ‘regular’ varieties. Since this is my first foray into tomato growing, I didn’t know how many tomatoes to expect, so I prioritized my list of tomato needs (wants, really), so I would be sure to end up with my favorites if my crop was less than bumper. Salsa – it’s a pantry staple in our house. It’s not just a dip for tortilla chips for us. I use it in everyday cooking – you’ll see. 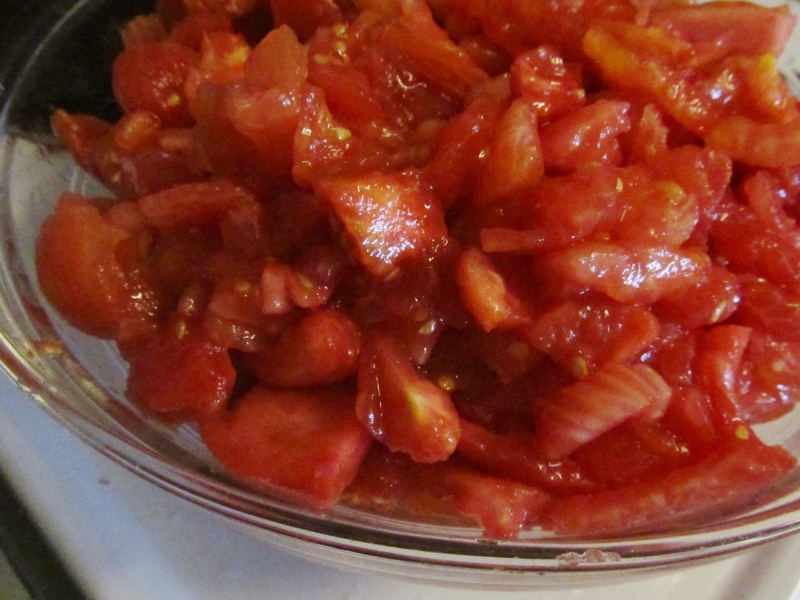 Diced – like I explained above, I use diced tomatoes throughout the winter for tons of dishes. It would be great to have a variety of diced like my old commercially canned versions. Pasta sauce – pasta freak that I am, I use a lot of marinara. I have frozen it in the past, but bottled has to be better. Pizza sauce – can we ever get tired of pizza? Certainly not the Hubs, who could literally live on it. Some homemade pizza sauce would be super nice to have. Paste and sauce – I can always use some basic tomato paste and sauce for everyday recipes. So far, I’m on #2 – I did some salsa a few weeks ago. I’ve made salsa in the past, but I didn’t can it. 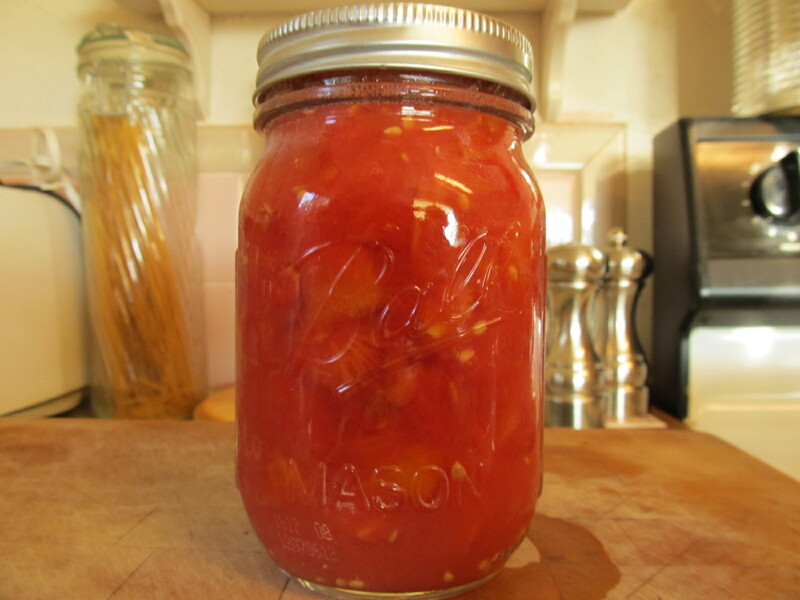 This year, with my new-found love for homegrown tomatoes, I knew I had to learn to can. I have friends who can and I knew the internet would help me along. I also bought The Ball Blue Book, which is the standard canner’s guide and I also bought a lovely book called Canning for a New Generation by Lianna Krissoff. I invested in a big pot to do the water bath step and also a basic set of tools and, of course, mason jars (aren’t mason jars the best little things?). My friend Mary taught me how to can salsa without using the water bath technique, which I’ll tell you all about in a future post about making salsa (UPDATE: apparently non-water bath technique is considered unsafe by USDA, so I cannot recommend it). Even though I canned the salsa, I didn’t feel like I had had the “real” canning experience since I got to skip the water bath part. So, armed with several pounds of tomatoes, I decided it was time to do this thing! I planned to use the traditional Ball Blue Book’s basic recipe for chopped tomatoes, which you can find on their website. Jars: I chose to make mine in pint jars because that’s about the amount I would use for most recipes. Next time, I may go to the half pints for a smaller quantity option. 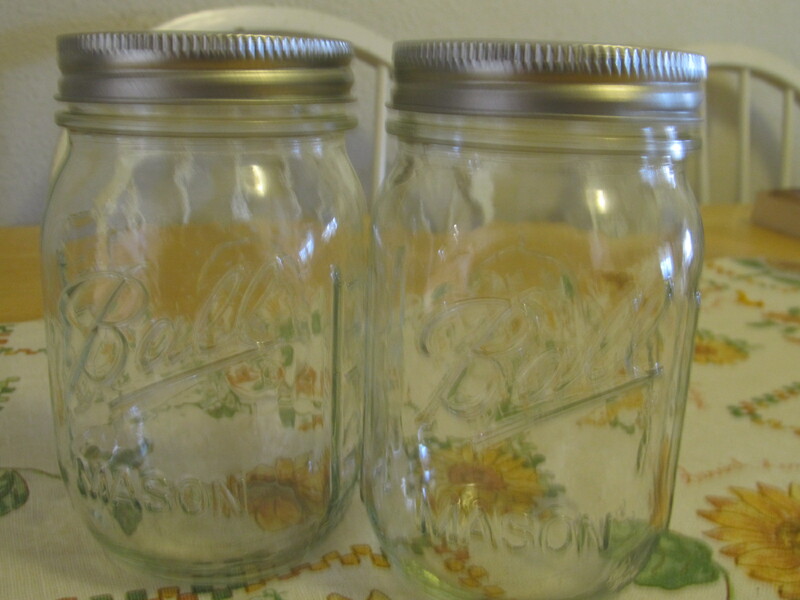 I bought my jars at the local big box store, but I have also seen them online. 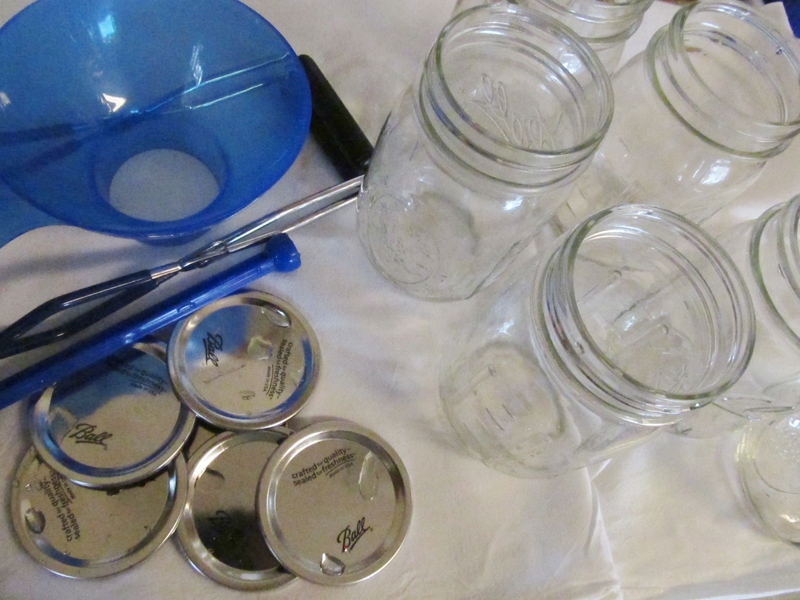 Remember, you can reuse jars and the outer lid rings, but you always have to get new flat lids to ensure a good seal. The good news is you can buy the flat lids separately so you can reuse last year’s (or grandma’s) jars. Work space: If you’re going to can tomatoes, you need to know that your kitchen will look like a crime scene when you’re finished – and you will look like the guilty party with all of that bloody red stain on the front of you. Cover your clothing and clear as much counter space as you can. This makes me laugh at myself. Have I told you about my ridiculously outdated and inefficient kitchen yet? Pink and tan tile back-splash. Forming an image? It’s worse than that – I only have two and a half cupboards and about two feet of work space by the (electric!) stove. BUT, if I can successfully can in my kitchen, you have no excuses. Tools: You’ll need three large bowls: one for the ice bath, one for the guts and peels and one for your chopped tomatoes. Besides the giant canning pot, you’ll also need a large pot for boiling the tomatoes and another for sterilizing the jars and lids. Find your best, sharpest knife and then sharpen it some more. It’s handy to have this basic set of canning tools, but you can improvise, if needed, with substitutes from your kitchen drawer. I highly recommend the jar lifter, though, because it will save you from scalding burns when you move the jars from the boiling water. 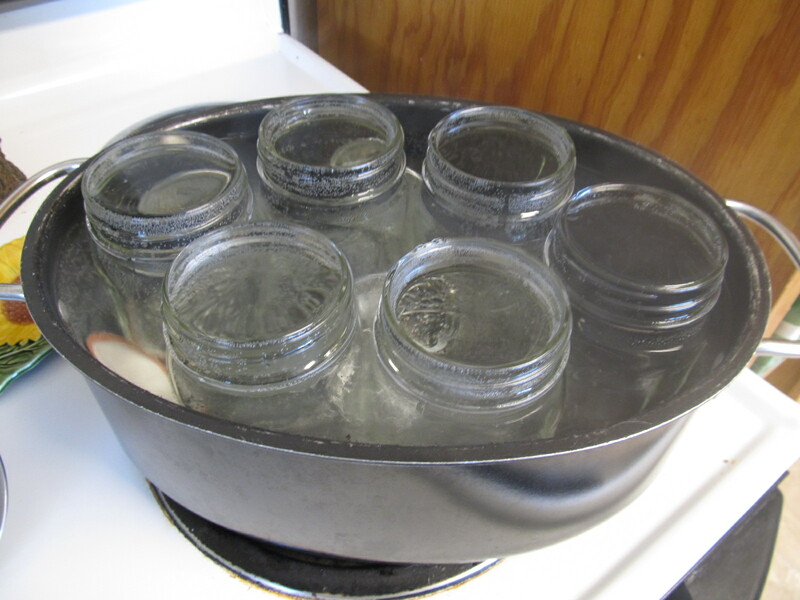 Jar Prep: The recipe explains that we need to sanitize and heat the jars in boiling water. I just put a few jars, along with lids, in a wide pot and set it on a low, not quite boil while I was prepping the tomatoes. I suppose I could have done it in the giant pot, but I wasn’t ready to fire that baby up yet. Tomato Prep: Meanwhile, get the water boiling in another pot. Since you have to peel the tomatoes (actually, you don’t HAVE to peel them if you don’t mind them but most people do. I don’t peel mine for salsa, but I blend them in the food processor, so the peels get pretty broken down), the boiling water improves the process. Put a few cups of ice with some water in one of the bowls. Once the water is boiling, put a test tomato in and then watch a clock. Take the tomato out of the hot water after no more than 1.5 minutes. Immediately dunk into the ice water. Let tomato sit and cool for a couple of minutes. Then try to slip the skin off. If it comes off easily, keep doing the same with the rest of the tomatoes. If the skin doesn’t slip off easily or of you have to poke it with a knife to get it going, try this: cut a very shallow slit in the side of the tomato before dunking in the boiling pot. Dip tomatoes in boiling water for now longer than 1.5 minutes. 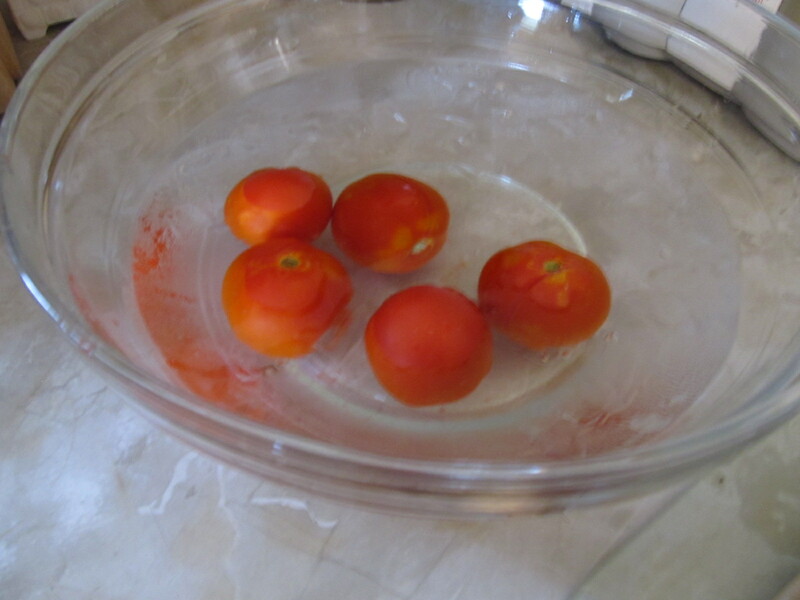 Dunk tomatoes into ice bath to stop the cooking and cool the tomatoes. I took my time and only worked with groups of five tomatoes, but you’ll find a groove after the first few tomatoes are skinned. After skinning, cut out the stem end and then seed it. 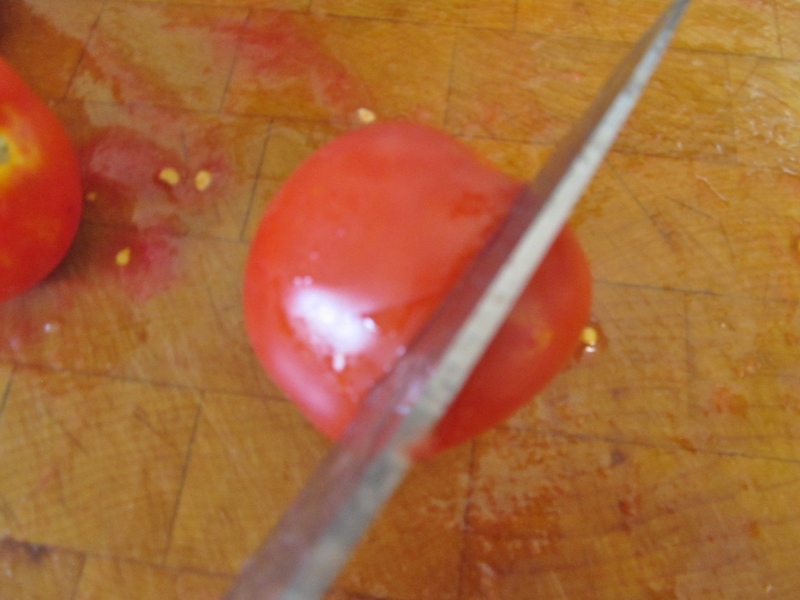 I found it helpful to slice the tomato in half horizontally (make your pre-boil slit horizontal to get it started). Once it’s halved, use your fingers to squish the seeds from between the ribs. Personally, I don’t mind if there are some seeds left hanging around the diced tomatoes, but some folks are pretty opposed to leaving any seeds in tact. Fun fact: the seeds contain the highest concentration of vitamin C and much of the flavor. Your call with your own tomatoes. I tried not to mangle the tomato too much, so as not to loose too much juice. After it’s seeded, go ahead and dice it up and throw it in a bowl. After skinning, seed then dice the tomatoes. Once all of the tomatoes are skinned, seeded and diced, we’re ready to can ’em! This is when I got the gigantic pot boiling. Mine has a rack that sits inside to hold the jars up off the bottom, so I pulled that out before I filled with hot water and set to on the burner. Meanwhile, I carefully pulled the jars out of the other boiling pot, using my jar lifter, and dumped the hot water out. I set the jar on the rack that goes into the big pot. 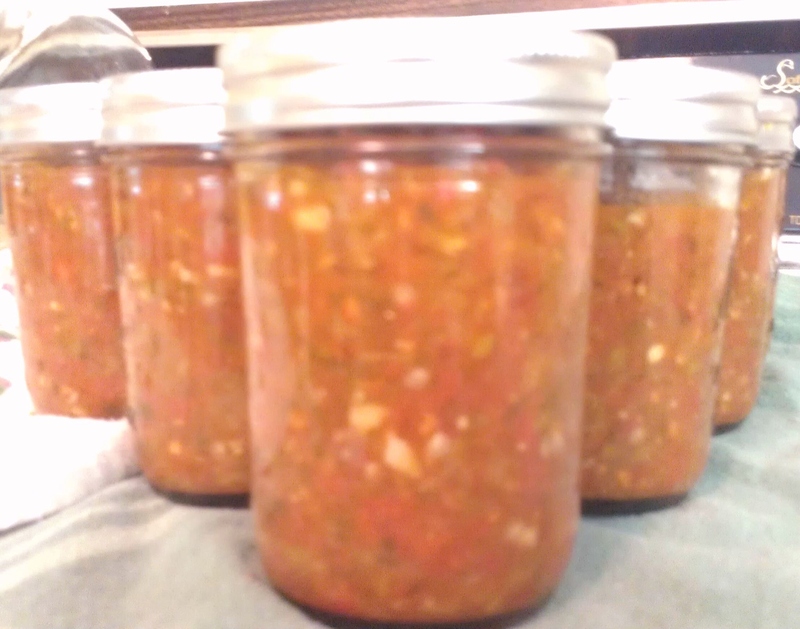 Once I had six jars set up, I used my wide opening funnel and a ladle to fill the jars with the diced tomatoes. 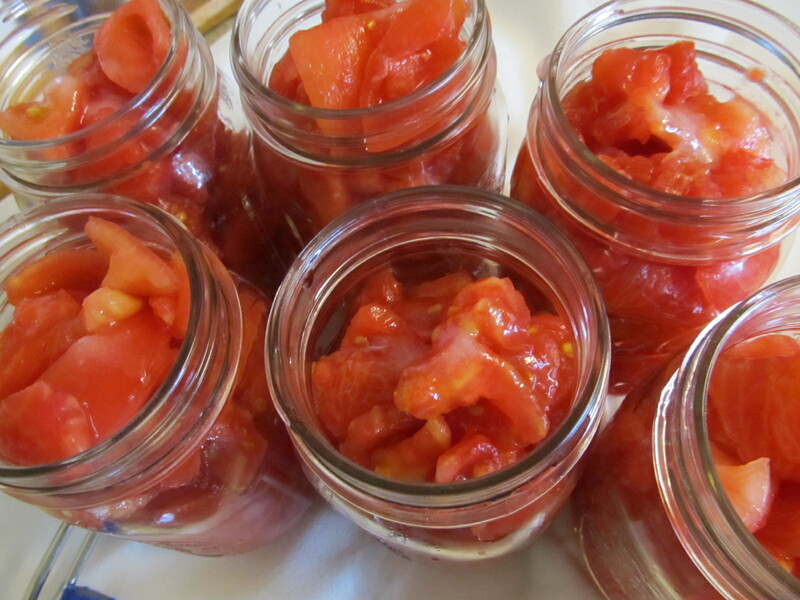 Fill the jars with the diced tomatoes – pack tightly! One mistake I think I made was that I didn’t pack the jars tightly enough. I was probably being too gentle with them, but the point is to have diced tomatoes, not a jar full of fluid. The recipe says to fill with boiling water, so I used the leftover water I blanched the tomatoes in earlier. I had to add quite a bit, again – I should have packed more tightly. Use a chop stick or spoon handle to poke around and remove air bubbles. It’s ok to really stir and poke, as this will lead to a tighter pack. Add more water or tomatoes to fill it up, but leave about 1/2″ of head space at the top of the jar so it has room to expand while water bathing. IMPORTANT: Unless you want botulism, you have to add either 1 Tbsp lemon juice or 1/2 tsp citric acid to each pint jar. 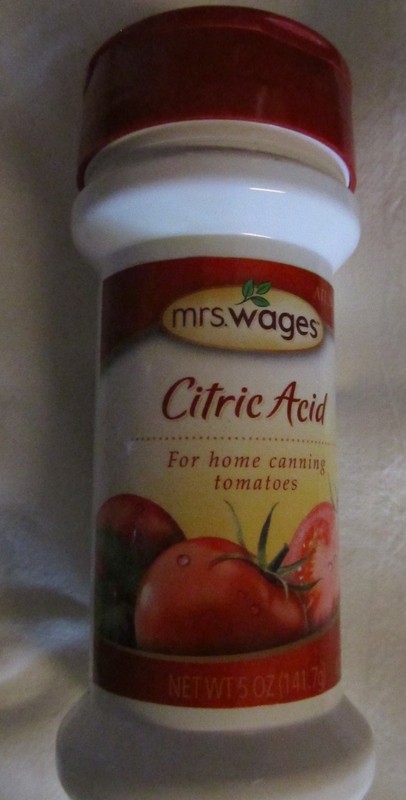 I used citric acid, but would probably use lemon juice next time because I’ve read it tastes better. I also added 1 tsp salt, which is optional. You MUST add citric acid or lemon juice to each jar or you will kill people! Add salt, if you like, and clean up the rim of each jar. Be sure to leave about 1/2 of head space at the top of the jar. 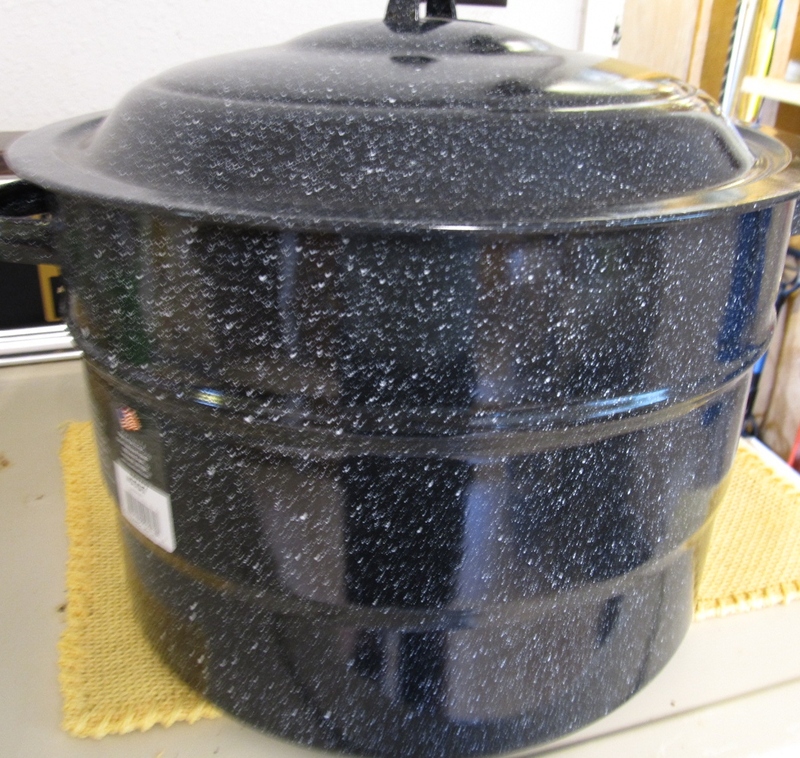 Once the jars are full and the rims are clean, place flat lids on top and screw the outer ring on – just “finger tight” is fine in case air bubbles need to escape during boiling. Now it’s time to put all of the kids in the bath. I set my rack o’ jars down into the giant pot of boiling water (yes, it was a little scary) and used the jar lifter to set the jars upright, as needed. 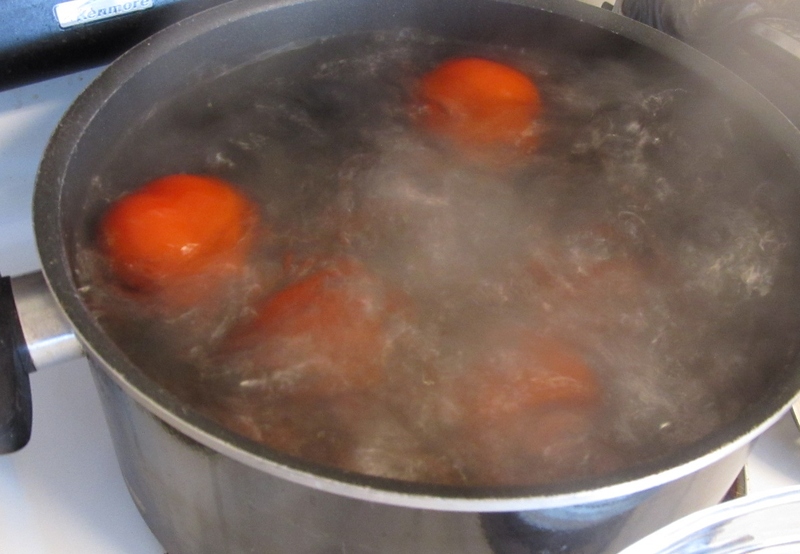 Make sure the water covers the jars by about two inches, then make sure you have a full boil and cover the pot. Keep it boiling! The recipe says to process pints for 40 minutes, but you have to adjust if you’re at a higher altitude according to this chart. I live at about 6,800′ so I had to add 15 minutes. So, I had almost an hour to clean up the crime scene while it processed. Once time is up, use the jar lifter to pull the jars out and set them someplace they can be left undisturbed for at least 12 hours. The flat lid is supposed to seal to the jar. This can take up to 24 hours and you’ll know it’s sealed when the lid will no longer flex when you press the center. If it doesn’t seal within 24 hours, it didn’t seal and you’ll need to refrigerate the jars instead. Mine were sealed almost immediately. I had separation of the tomatoes and liquid, but it’s ok! I was worried! Did I just waste all of my tomatoes by doing something wrong? I immediately went to my favorite canning expert: Marisa McClellan who writes Food in Jars. She has great info on her blog and I found this post that explained that I probably did something wrong – like got it hot and cooled a bit -but it’s still edible! YAY! The hubs looked skeptical, so I shook the jar (after it was completely cool) and it looked much better. After completely cool, just shake it up and it’s all pretty again. So the work paid off! I have six pints of beautiful, freshly canned diced tomatoes I can use this winter when the garden is over and the produce in the market is from faraway places and tasting bland. Was it simple? No. Worth it? Yes. It is so empowering to know that I was able to grow my own tomatoes in the backyard and then preserve the harvest for year-round healthy, fresh cooking! OH, and I should tell you that I now like raw tomatoes! If I grow it, I like it and I eat it! Notes for next time: I would also like to try the raw tomato with no added water recipe. 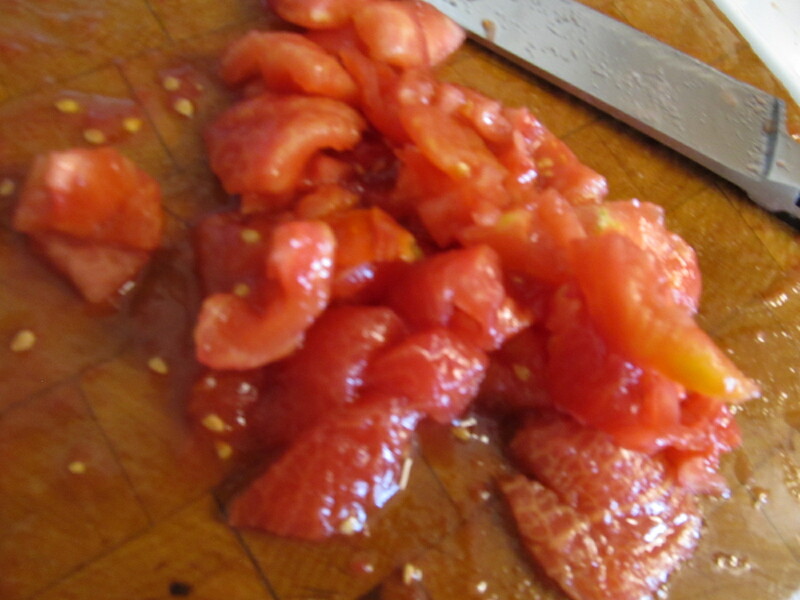 I will keep researching other types of diced tomato recipes – I think some allow for added garlic, herbs, etc. Finally, I didn’t really like the part where I ended up with a bowl of seeds, skins and tomato guts that I had to waste (well, I did compost it). So, I’m researching what I could do with all of the leftovers instead. I hope the tomato crop continues to produce so I can get through the rest of my tomato priority list, but it’s getting a little cool here in SW Colorado. 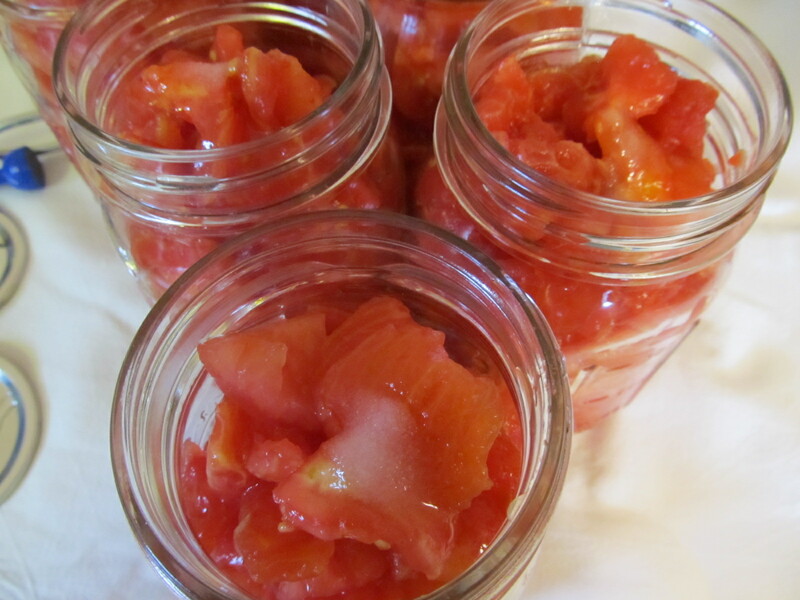 For other canning recipes and ideas, see my “Canning and Preserving” board on Pinterest and follow Cooking Ripe! on Facebook for more cooking and gardening tips and tricks. 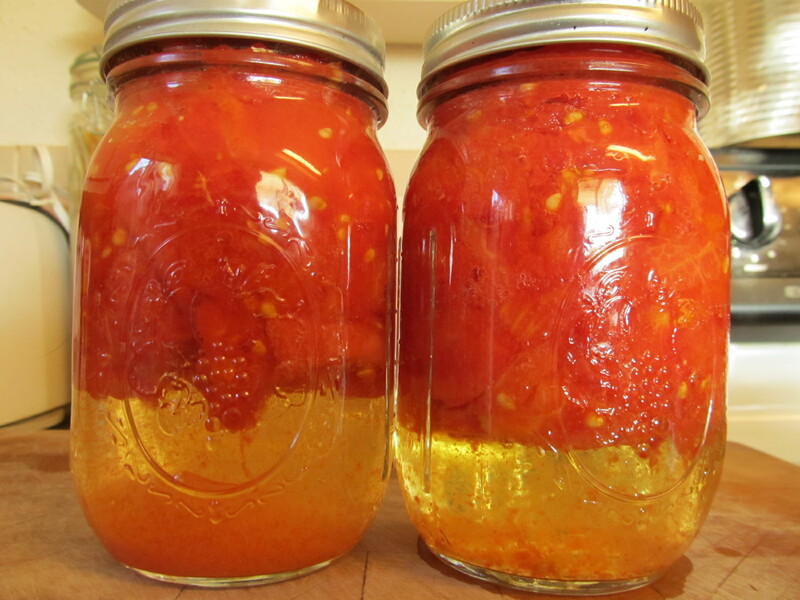 Update: Well Preserved shared a great way to peel lots of tomatoes fast! 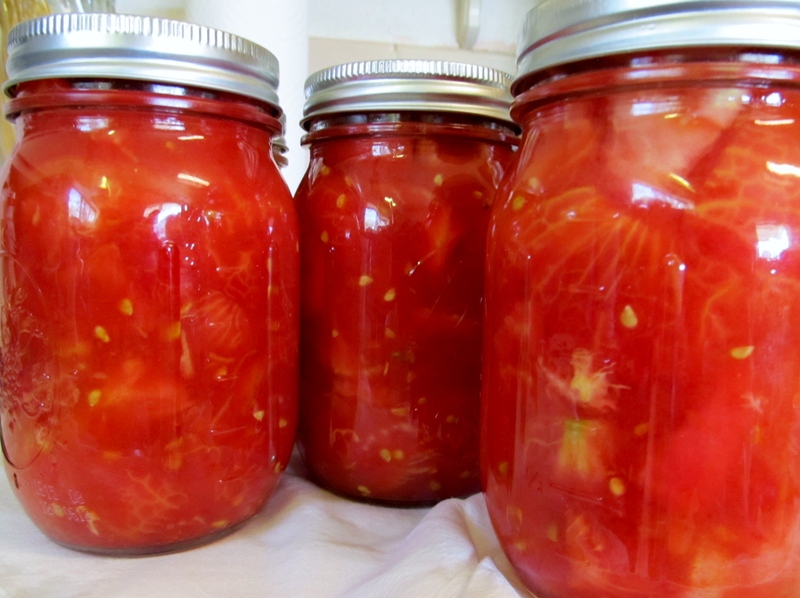 Categories: Canning, Cooking, Garden, Preserving, Veggies | Tags: Canning, Canning Tomatoes, Cooking, Diced Tomatoes, easy, Fresh, Garden, gardening, Grow, healthy, homemade, ingredients, low-carb, low-fat, preserving, recipes, simple, tomatoes, vegetables, Vitamin C | Permalink.